I’m not sure why, but I’ve been rather shy about mint in my cooking career. Did I have a traumatic experience with mint at some point in my life? The overdose on wintergreen Life Savers that I went through as a child? 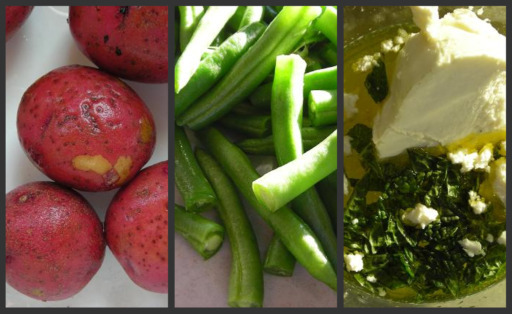 Why has mint not been forefront in my culinary dishes? I haven’t an answer, but as of late, I seem to be making up for lost time on the mint appreciation. It’s been all over the place. Mint has been a regular in my fridge as of late and I’m only just beginning to understand the reaches to which this herb can go. A huge thick bunch is about $1.50 at the grocer, and wrapped in a damp paper towel in a plastic bag, it lasts for quite some time in my fridge. The last thing I ever thought I would be doing would be eagerly and gleefully searching out recipes that will include mint. Or making them up, as it turned out. 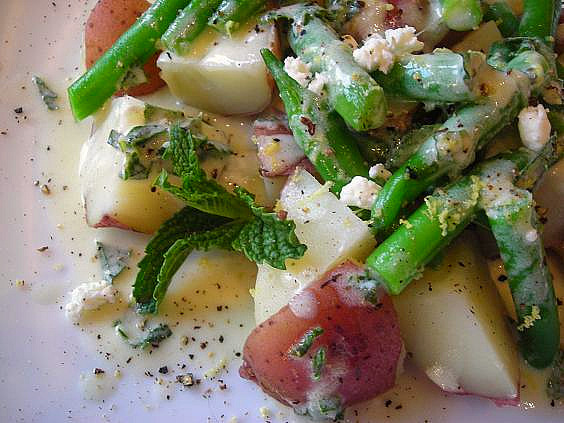 Like this Lemon Mint Potato Salad with Green Beans. I browse hundreds of food sites, recipe sites and food information in any given week. I am always undertaking a study of food in all it’s glory from the amazing array of food blogs both stellar and odd, to the sites that talk food, culture, nutrition and diet. I know that somewhere in my browsing I came across a dish similar to this because it’s the only way I can think that it got into my brain at some point, and the mere action of holding onto a bunch of mint at the grocer made it jump front and center, to the spot where all my creativity pours out. It’s rare that I really smack a home-run the very first time creating a recipe from scratch, but this one worked. On all levels. The crunchy beans, moist potato and superbly tart and lemony dressing, with hints of mint and dijon mustard come together in a lovely symphony of simplistic eating. I was sad when I was full. Place potato and beans in a medium bowl. In a small measuring cup, whisk together lemon juice, lemon zest, olive oil, mustard, goat cheese and 2 T. of the mint until smooth and creamy. Season to taste with salt and pepper. It will be very tart and lemony, with a subtle mustard zing. Pour over potato mix and gently stir to coat. Serve room temperature or chill for an hour or more before serving. Top with mint leaves and extra salt and pepper before serving. The kind folks at Ile De France cheese regularly send me free cheese to try at home, and I am very grateful for their generosity. The goat cheese used in this recipe is one of their offerings, a 10.5 oz chunk that is fresh and flavorful, with a subtle hint of herb and grass and a terrific texture that crumbles easily, melts superbly and whisks smooth in any number of options. It lasts for a good long time wrapped up properly. Thanks so much Ile De France!! Yay! Saw you on Foodshots! This is one gorgeous salad and you do it perfectly! 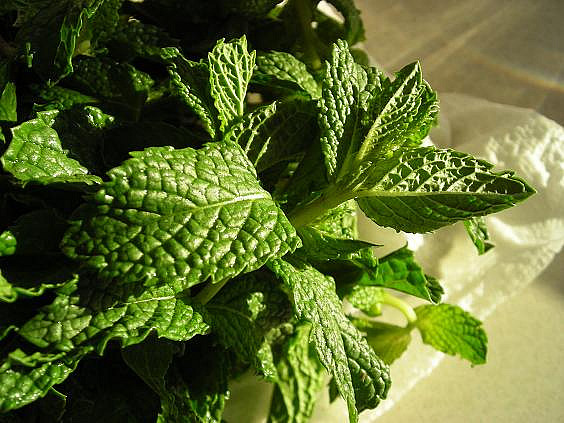 *Sigh* you are now making me daydream of mint. Husband would be thrilled if I used the mint he planted for me. Maybe this salad. Lovely! This looks delicious. Another must do…looks too good to pass by!